It would not surprise me to find out that the 4H Club and Tyson Foods were behind Heifer, using Heifer as a non-profit front group to advance a twisted mission that combines charity to the world’s poor with the promotion of the Western diet and the Western view of animals as commodities. Of all of the bizarre moral acrobatics used to explain why we continue to needlessly exploit animals, Heifer International’s brand of dominionism gives new meaning to this archaic belief of human privilege over other species. It would not surprise me to find out that the 4H Club and Tyson Foods were behind Heifer, using Heifer as a non-profit front group to advance a twisted mission that combines charity to the world’s poor with the promotion of the Western diet and the Western view of animals as commodities. But I’m not even posing a conspiracy theory. That is why for more than 68 years, we’ve been providing families with livestock like cows and training they need to support themselves. A family with a cow has milk to drink every day. And they often have extra left over to sell for income that they can use for school, shelter and medicine. That’s right, while the World Wildlife Fund’s new ad campaign reads “I am not a rug” and portrays a beautiful tiger, Heifer instead boasts about making a sweater out of an animal, not because it is necessary to do so, but just because we can. Of course Heifer could provide plant-based products and training to the poor ”to help them support themselves” without living off of the backs of animals. This would have many advantages for helping the poor and the planet. It would eliminate the ethical problem of using other sentient beings as our resource in an age when we no longer need to and it would promote a more ecological and responsible use of the earth’s limited resources. 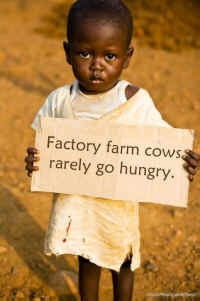 Why instead does Heifer seek to help the poor by exploiting the most vulnerable and exploited animals on the planet? It just doesn’t make sense, that is, until you realize that dominion is central to their mission. Dominion feeds the human ego. It makes us feel more powerful over others. It serves no other purpose than this. And Heifer is determined to use its vast resources to spread this message to the world’s poor while making its donors in affluent countries feel good about helping the poor.